I have loved Labyrinth since forever. I have watched it so many times. I love this film for all of its unsettling darkness and twisty humour. I love it for the amazing puppets and the brilliant sets. However, more than anything, I love Jareth the Goblin King (David Bowie). After the news of Bowie's death, I knew that I had to watch Labyrinth again. Of course, I wasn't alone. Many cinemas have screened Labyrinth over the past few weeks in tribute to a man who meant so much to so many. It is wonderful to watch Bowie in this iconic role. Labyrinth is an enduring cult classic thanks to the imagination of its director, Jim Henson. He was involved in every aspect of this movie and the decisions he made make this a truly magical film. When Henson sat down to create his evil Goblin King, he had an inspirational idea. Why not make him a rock star? Henson could think of only three people who could possibly fit the bill: Sting, Michael Jackson and, of course, David Bowie. The casting of Bowie was critical to Labyrinth's success - no one else could possibly be Jareth. Conceptual designer, Brian Froud, worked tirelessly on Jareth's look. Oh and yes those leggings were a part of his deliberate design. Jareth also carries a cane that Froud designed to resemble a microphone. Labyrinth features a fabulous sound track - how could it not? One song in particular, Magic Dance, has to be one of the most catchy films tunes. Seriously, once you listen to it you will be singing it all day - all week even. However, Magic Dance proved problematic for David Bowie. He wanted to use the baby of one of his backing singers for the song's gurgles. However, the infant wasn't interested no matter how much it was coaxed. As a result, Bowie ended up doing the baby gurgles on this track. Screenwriter, Terry Jones, has said that whenever he needed narrative inspiration he would look at Brian Froud's wonderful drawings. These drawings were then developed in a huge workshop filled with talented designers. Many of these designers had to create groundbreaking new technologies to bring the characters and sets to life. Jareth's Chamber is an impressive place. The room houses 40 puppets and over 50 puppeteers - co-coordinated by Henson's son, Brian. Brian called it a "crazy scene" and said that when they removed all of the puppets it looked like "Swiss cheese... there's holes everywhere". While watching Labyrinth you can't help but be impressed by the imaginative storytelling. We have, of course, the talented Terry Jones to thank for this. He found the almost unlimited potential offered by Henson's puppets to be hugely liberating and let his imagination run wild. Many actresses auditioned for the role of Sarah - including (according to reports) Jane Krakowski, Sarah Jessica Parker and Laura Dern. However, Henson knew that 14 year old Jennifer Connelly would be perfect for the role. It is hard to imagine anyone else playing Sarah now - not bad for a girl who actually wanted to be a vet! At the start of Labyrinth's development, Jim Henson and Brian Froud decided to introduce a human baby into the story. "We thought that a baby would be an ideal thing to play off against the creatures," explains Froud. He started to paint what this dynamic would look like. Six months later, Froud's own son, Toby, was conceived. Spookily, when he was born he looked just like the baby in the painting. Toby was then cast in the film. Who doesn't love Hoggle? However, he wasn't an easy character to work with being the most complicated and technically advanced puppet in Labyrinth. It took five people to operate Hoggle - one actress inside the costume and four radio crew to control Hoggle's head. (18 motors control his facial movements.) Hoggle is voiced by Brian Henson. After the film. Hoggle became lost in transit and can now be found on display at the Unclaimed Baggage Centre in Alabama. 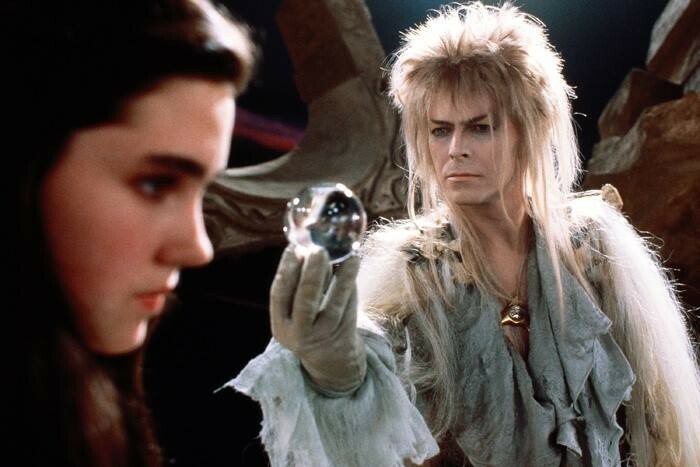 In several scenes, Jareth plays with a set of crystal dream spheres - this was Henson's way of showing his audience that the Goblin King has special magical powers. However, that is not David Bowie's right hand. This hand actually belongs to juggler, Michael Moschen. Moschen crouched behind Bowie during filming. Henson described Moschen's ability as being "as close to real magic as anything that I really know". Labyrinth features a number of Jareth faces hidden in various scenes. There are about seven in all - have you spotted them? Elliot Scott designed the amazing sets for Labyrinth. They look so real - and that is simply because they are real. Each one painstakingly designed and created - often to scale. Quite an impressive feat. Henson's use of real sets and physical effects is one reason why Labyrinth looks so timeless today. Can you imagine how dated this film would look if Henson had relied solely on CGI? Just think about that owl at the start - what looks so basic now was groundbreaking in 1986. I just love the ballroom scene in Labyrinth. I remember being bewitched by it when I was younger. Jim Henson saw this scene as being Sarah's fantasy. As a result, he wanted it to have a "dream, trance-like quality" (all choreographed by Cheryl McFadden). This is one of the few scenes in the movie that features people and no puppets. Henson said that this made it one of the easiest parts of the movie to shoot - and the most fun. As well as being a wonderful family film, the production of this movie was also a family affair. Both Jim Henson's son and daughter worked on the film and, as we've discussed above, conceptual designer Brian Froud's baby son plays Toby. In addition, David Bowie's son, Duncan Jones (Moon, Source Code, Warcraft), fondly remembers visiting his Dad on set and being inspired to become a film director. Apart from the magic of the film itself, Labyrinth feels special because it was Jim Henson's last film. Tragically, he died on 16 May 1990, aged 53, from streptococcal toxic shock syndrome. 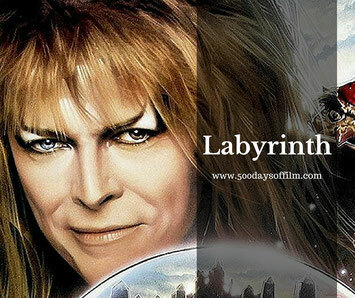 Labyrinth was not a financial success when it was first released in 1996. It only recouped about half of its $25 million budget. However, before long, the film gained cult status and is now loved the world over. Thankfully, Henson was aware of this before he died. Since its release, Labyrinth's plot has been examined, interpreted and reinterpreted in many different ways. Just Google it and you will find a real rabbit hole of stuff. Mere weeks after David Bowie's death, news leaked that Sony's Tri Star film studio was planning a Labyrinth sequel. It pretty much broke the internet - no one was ready to accept this idea. Screenwriter, Nicole Perlman took to Twitter to reassure us that "no one is remaking 'Labyrinth'. That movie is perfect as it is". Perlman further explained that "Labyrinth is my favourite film from childhood, so I share your concerns that any continuation of the world be handled with love and respect." Do You Love Labyrinth Too? Do you love Henson's Labyrinth as much as me? If you do, I'd love to know your reasons why - let me know in the comments section below! I grew up watching this movie. It was my all time favorite! I basically wore the vhs tape out. Sarah, Jareth and Diddymus are my favorite characters. And yes, the ballroom scene just takes my breath away, especially when Jareth stares Sarah down the whole time. I would love for Duncan Jones to play Jareth if a Labyrinth part 2 was ever in the works. Duncan is near Jennifer Connelly's age and is a spitting image of his father-David Bowie. So it'd work out fine!